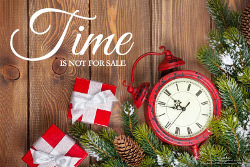 Time Is Not For Sale. Of all the gift-giving options you have, there is one that can make a tremendously positive impact on someone who needs a reason to hope - and that is the priceless gift of your time. Time cannot be bought because it is not for sale, but it is something you have right now that is more precious than gold or silver.